The magnificent Rixos Premium Bodrum Hotel is located in Zeytinlikahve Cove, one of the most exclusive areas in the Bodrum Peninsula on the coast of Turkey. Combining ultimate luxury with untouched nature, this 5 Star castle-like retreat is a superb base for couples and families with a stunning private beach and a total of 341 attractive rooms and suites surrounded by lovely gardens overlooking the sapphire blue Aegean Sea. Guests to the Rixos Premium Bodrum Hotel can explore the delightful villages nearby, discover ancient ruins from the times of Halicarnassus, and experience real Turkish hospitality. Bodrum Milas Airport is 45 km from the hotel. 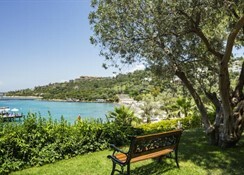 Local Tips: The hotel is 2 km to the nearest residential town of Torba and 10 km to Guvercinlik. 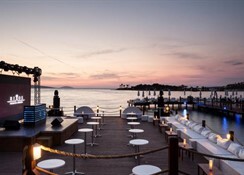 Bodrum City centre is 10 km from the hotel. 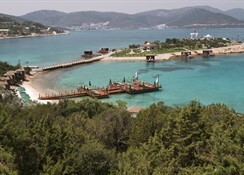 Vita Park Golf 18 hole course is only 15 minutes away from Rixos Premium Bodrum! 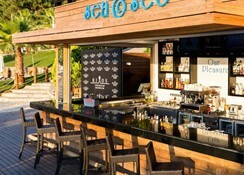 Food, drink and entertainment: Rixos Premium Bodrum Hotel guests can take their breakfast in the main restaurant Sini as well as other meals with an open kitchen buffet, enjoy lunches at the casual Zest and Azur restaurants,A choice of 6 bars are on hand for cocktails, coffees, snacks and more, along with the popular late night Layali Club, the Mojito Bar, and 24 hour room service. Sports, games and activities: Outdoor swimming pools, children's swimming pools, private beach, sun beds, hammocks and umbrellas, Cabana Huts available with reservations, soccer pitch, basketball court, Yoga classes, professional dance classes, step, beach volleyball, water gymnastics, water polo and various pool games, Sailing, Jet Ski, Water-skis, Catamaran, numerous inflatable sea toys (ringo, banana) for adults and young adults, surfing, certified diving school onsite, Hobby Club, Spa and Wellness centre with Turkish bath, sauna, Jacuzzi, indoor pool, steam room and gym completely free of charge, beauty and relaxation treatments and massage services with charge. Some activities and facilities are with charge. For the Kids: Rixy Kid's Club for ages 4 to 7, 8 to 12, and 13 to 16. Activities like team games, handicraft workshops, t-shirt painting, sand painting, educational and fun team- building games, soccer activities, mini basketball, Aqua Fun, Tournaments, Kids Gym Hall, Game Park, Sand Pool, mini disco, open between 20:30 and 21:15. Additional: 24-hour reception, currency exchange, safe deposit box, babysitting available for an additional fee, three meeting rooms for conferences and events with business equipment, well- kept outdoor area for weddings and gala dinners with spectacular views of the Bodrum peninsula. Honeymoon added value of Candlelight Dinner, free bottle of wine in room, fruit basket, room upgrade (subject to availability) and VIP treatment. Rates and conditions are valid for uk passport holders only. 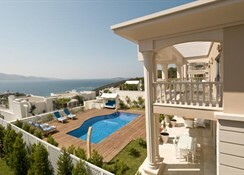 The 5 Star Rixos Premium Bodrum Hotel features a total of 341 air conditioned rooms in various categories. All rooms have a private bathroom (bath and shower, hair dryer, WC), mini bar, bathrobe, slippers, specially designed his & hers bathroom toiletries, flat screen Satellite TV, safe box, Broadband wireless high speed Internet, telephone, tea and coffee making facilities, and balcony with garden or sea views. Free baby cot available on request. Room categories are Deluxe Room with Garden View (max 3 people), Premium Room with Sea View (max 3), Suite Room with Sea View (max 3), Superior Suite Room with Sea View (max 4), and Family Suite with Sea View (max 5). Note: Zeytinaltı Kebab House has been closed, Aja Restaurant has and been closed and Pets are not allowed.